After making the Hazelnut Baci, I was eager to discover what other great recipes were in Gina De Palma's Dolce Italiano. 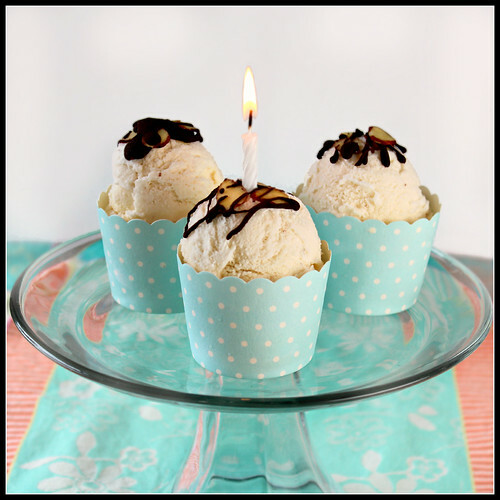 I've never had an almond gelato, and this recipe sounded easy and the preparation intrigued me. Almonds are toasted to bring out their full flavor, and then steeped in the milk and cream. The toasty almonds definitely infuse the gelato and give it nice flavor, and the amaretto liqueur helps it stay creamy. But I've got to be honest -- there was nothing wrong with the gelato, and yet it failed to knock my socks off. It was nice to try something different, though. I also don't recommend the melted chocolate drizzle, since the chocolate overpowers the delicate almond flavor. Wondering about the candle? I realized that I missed a milestone last month, when my blog entered its fifth year! A huge thanks for stopping by, and I hope you keep visiting. Happy Friday! Preheat the oven to 375°. Spread the almonds in a single layer on a clean baking sheet and toast them for 12 to 14 minutes, or until they are golden brown and aromatic. Remove the almonds from the oven and place them in a medium saucepan. Add the heavy cream, milk, sugar, and honey and place over medium heat, stirring occasionally. When the mixture comes to a boil, remove the saucepan from the heat and set aside to infuse the liquid with the flavor of the almonds. Allow the mixture to cool to room temperature, then strain it through a chinois or fine-meshed sieve and discard the almonds. Stir in the salt, amaretto, and almond extract. Chill the gelato thoroughly in a covered container, at least 3 to 4 hours. Freeze it in an ice cream maker according to the manufacturer's instructions. Did you say 5th? Now I look at your archive and realized it is 5 years (not that I didn't believe you!). My gosh, I've been missing out SO MANY of your posts Shirley! But better than not discovering your blog at all. I'm thankful for that. Congratulations to your 5 years and looking forward to many more of your creations. I love almonds most among all the nuts. I will definitely love this ice cream flavor! Nice gelato! 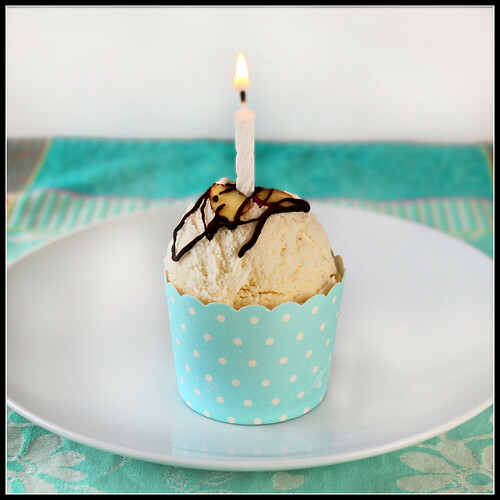 Congratulations on your fifth blogoversary! oh I thought it was cake at first! Toasted almond ice-cream? I am in! Thanks!! A do-over would probably be too ambitious, considering it took me a month to even remember the anniversary. lol I'm sure I indulged in something more satisfying in the meantime.